There are already numerous ways to set up an Eco-based system. 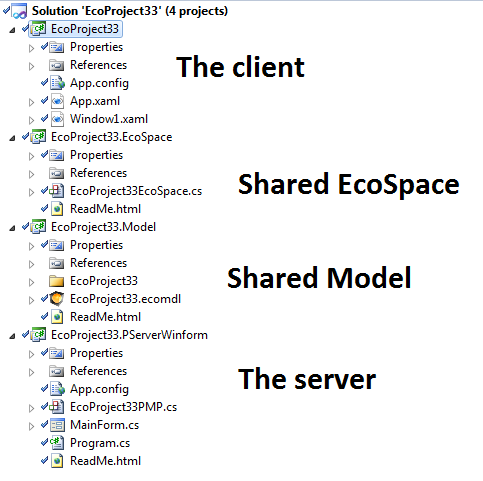 Besides having a multitude of PersistenceMappers that enables Object-relational mapping for the most popular databases – Eco also provides a Bridged communication between an Eco-client and an Eco-server. 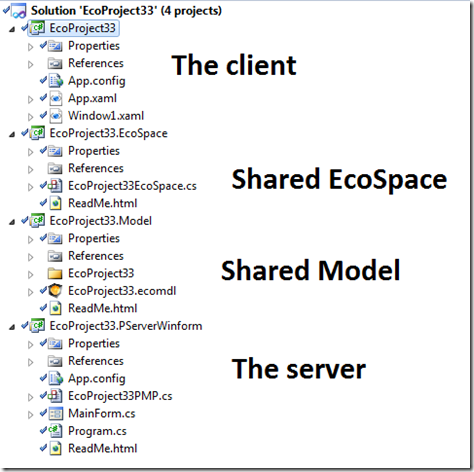 Since Eco6 this is performed by the EcoPersistenceClientWCF (client) and the EcoPersistenceMapperProviderWCF (server). The client does not need to know anything about the database being used – hence no distribution of Client-db-communication-setups. The server does not need to expose the database for client calls and thus invite attacks from all the suckers out there. The Server is able to provide you with an efficient Refresh mechanism that easily can be set up to synchronize all the clients. Since Eco6 the bridge is implemented with WCF – before Eco6 this was implemented with .net Remoting – but WCF is much more flexible and configurable and better in everyway. Eco creates a BasicHttpBinding if nothing else is configured. This is a quick way to get things going – but of course many situations call for better security, less overhead and/or authentication that is easily achieved with WCF. Maybe you want to create your own binding implementation to solve some business requirement and WCF is good for that too. I added a sample, EcoProjectWCF_NET_TCP_Binding to show how to configure different bindings than the standard BasicHttpBinding. It defines a named EndPoint “TheEndPoint”, it defines the binding as netTcpBinding and it has the IPersistenceMapperWCF contract. This Contract is the same for every Eco client server bridge. Also note the Address that points out the server – we need to make sure that the server is available at that address – server configuration is explained in the next section. 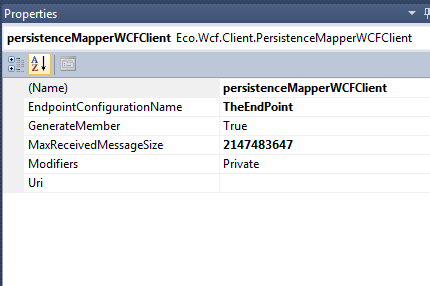 In the EcoSpace, that is shared by the client and the server but nevertheless the place to define the client persistence mapper, we have added the PersistenceMapperWCFClient. In order to use the setting from the App.Config we set the EndpointConfigurationName to the one used in the config : “TheEndPoint”. Done. Client is all set. 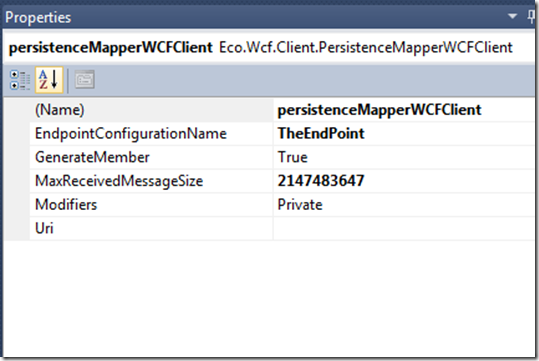 When the EndpointConfigurationName is set, the PersistenceMapperWCFClient component ignores the Uri setting. The Uri setting is only there to give an address to the server for the default BasicHttpBinding, also the MaxReceivedMessageSize setting is ignored since this is better defined on the binding in the App/Web.Config. <!--  Following is the expanded configuration section for a NetTcpBinding. Each property is configured with the default values. A good feature is that you can add several endpoints to your service – so that you can have multiple types of clients that communicate in different ways. Silverlight does not support all that many Bindings (not our fault) so Silverlight clients need to talk over http. But if you have in-house clients or ASP.NET servers on the safe side of the firewall you will want something more efficient most likely. guest00: Thanks a lot, Hans! Could you please give the link to the build you used for this example?